Episode 160, with me, Jon, from Marketing for Owners, and I am back on the beach. I still see some fishing boats in the background. They still have fishing boats around here in Dale, in Kent, in the UK, England. France is just over there, 22 miles away, it’s a very sunny day! I can actually see it from here. For those of you listening on iTunes, sorry. You have to come on the marketingforowners.com/podcast to see all the videos. These are little short videos. It’s much better for listening, but maybe not if you didn’t click in and stuff. Do you ever feel like you tell yourself there is just SO much to do! The other day, I talked about productivity. One of the things a lot of us small business owners and young entrepreneurs get wrong is not saying ‘no’ to things and saying ‘yes’ to everything. Quite often, we tell ourselves that if we say ‘no’ to something, then we are turning away money, or we’ll upset someone, or they won’t give us an order next time, or they’ll take their money to our competitors and deal with them instead. 1. –If your customer likes you enough, then even if you give the reason why you can’t do something, they’ll be back. 2. — Your competitors already has customers. They might get this one as well, but they already have customers. You’re not going to shutdown, they’re always going to be there. Think of competitors more of colleagues that you need to form a relationship and a partnership with and be friends with, then they won’t pitch your customers. That works, by the way. 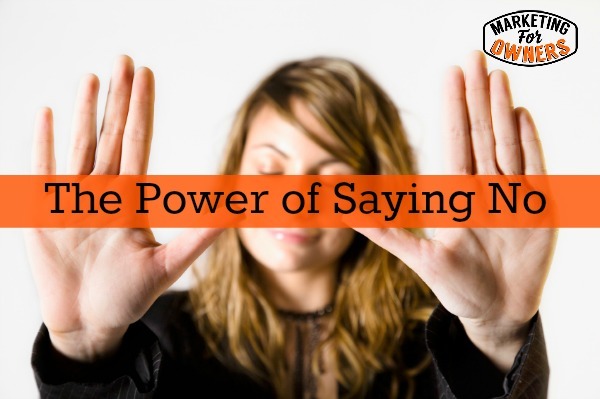 But just think to yourself that it is OKAY to say ‘no.’ When you say no to a customer, it all depends on how you say it that works. Doesn’t that sound a lot better than “No” or “I don’t do that.” Just think about it and just be nice to your customers. Now, this is going to be a weekend challenge for you. So as usual, get a pen, get a piece of paper, and first things first, I want you to write down your core strengths. If you’re not quite sure about this, get a book called “Strength Finders,” it’s based on a lot of research by the Gallup Company. In the test, you’ll be able to find out what your strengths are. Because, if you have certain strengths and certain weaknesses, instead of therefore working on those weaknesses to make them better, don’t do those weaknesses at all. Work on your strengths to make them incredible! Get someone else to do the stuff you’re weak at. Again, big mistake we make as entrepreneurs! Trying to make our weaknesses into strengths, never going to work. So, work out what you’re good at. Over a period of week or so, everyday write down every task you do just after you’ve done it. At the end of the week, summarize and find out what stuff you do, what stuff you shouldn’t be doing, and what stuff you should be doing is another way of doing it. Next step by the way, what tasks are you doing that you do not like doing? Yes, you have a choice! So for instance, in my business, I like marketing stuff. Do I want to pack stuff in boxes? Not really. Do I want to deal with staff and HR issues? Not really. Do I want to do the accounts? Not really. Do I like marketing? Yeah! Would I rather do nothing? Yeah. Hey, you’ve got to do something, eh? So that’s the next one. Now, simple, the next task. 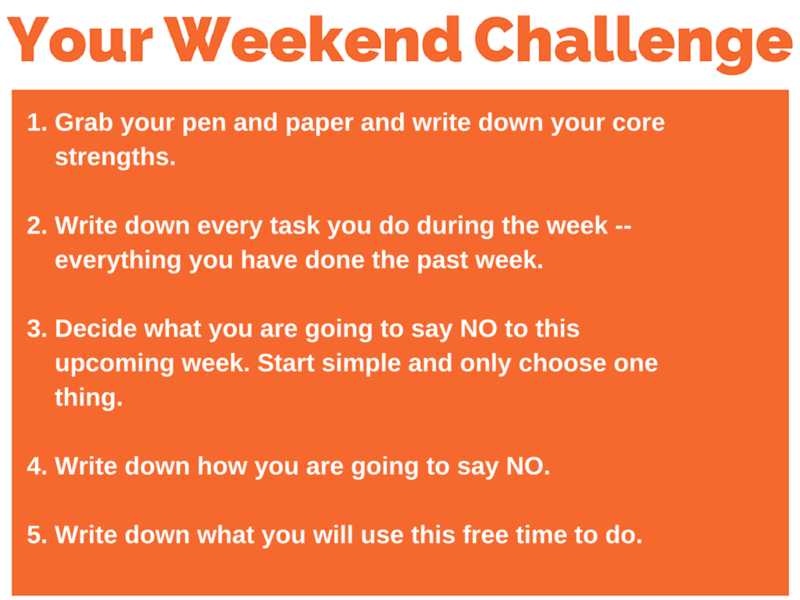 Next one, write down, what are you going to say ‘no’ to from next week? What are you going to stop doing? So start gentle. Just pick one thing. Just don’t do that anymore. Whether it’s some customers, sales, we don’t do that anymore, or whether it’s at work. “I don’t do that anymore.” You understand how this is going, yeah? Now the next one is to write down how will you say no. Form a sentence and practice it, because this is not going to be easy. You’re going to struggle in saying “no.” Practice it and have a fixed answer. Finally, I want you to write down exactly what you will use this freed up time to do. What are you going to replace that with? What are you going to do instead, or what are you going to do more of? Because the reason to free up that time by saying “no” is to enable you to do what you like doing or what is more productive or more effective. So remember, that’s what you’re going to do! 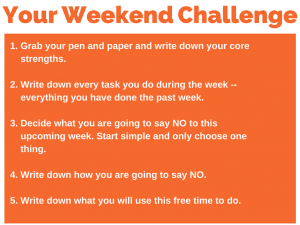 It’s a weekend challenge! It doesn’t take long, this one’s an easy one! Hey, even I can do this one, so go for it! Enjoy the sunshine and I’ll see you on Monday!